Drew White currently serves as the Medical Director of Emergency Services at Washington Adventist Hospital and Metropolitan Patient Services Regional Director of Maryland. Moreover, Dr. White has served as President of the Medical Staff for the past two years at Washington Adventist Hospital and currently serves as Past President of the Medical Staff. 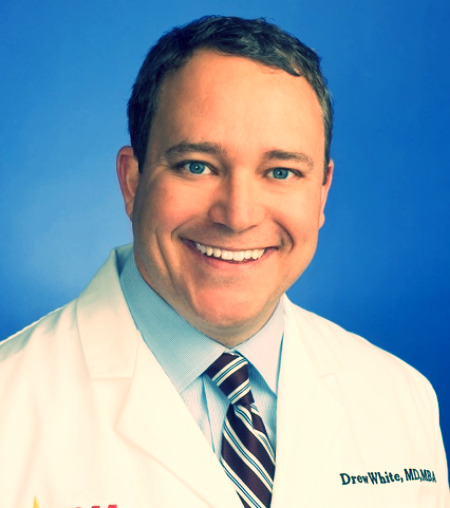 Dr. White has had multiple year terms on Credentials Committee (former Chair), Bylaws Committee, Quality Council (former Chair), Stroke Committee, Chest Pain Center Committee, Medical Staff Quality (current Chair) among many others. In recognition of his significant contributions to the Hospital and Emergency Department, and as a reflection of the high regard in which Dr. White is held in the Adventist Healthcare System, he was named to the Adventist Healthcare Board of Trustees where he chairs the Board’s Quality and Patient Safety Committee. Dr. White completed his residency in Emergency Medicine at Johns Hopkins where he was Chief Resident. He is extremely active in Maryland Emergency Services affairs and currently serves on the Board of Directors of the Maryland Chapter of the American College of Emergency Physicians. Dr. Chopra currently serves as the Medical Director and Chairman of Emergency Medicine & Observation Medicine. Prior to serving as the Director of Clinical Operations at the University of Maryland Charles Regional Medical Center, Dr. Chopra practiced at Novant Health Prince William Medical Center. He quickly rose from an E.D. attending to the Critical Care and Core Measures Coordinator and Co-Coordinator of Emergency Department Process Improvement. Dr. Chopra then served as the Associate Director and Director of Quality of the Emergency Department. Within EMA, Dr. Chopra is the System-Wide Coordinator of Hospital Revenue Enhancement. Dr. Chopra received his Medical Doctorate at The George Washington University. He subsequently completed his Emergency Medicine Residency at The George Washington University. Dr. Chopra is Board Certified in Emergency Medicine and a Fellow of the American College of Emergency Physicians.